Rugged PC Review had taken a look at the classic Flex 10 3 years ago and decided to do a new xTablet Flex 10A rugged tablet review and put the new Cherry Trail version through its paces. The New Flex 10A has been a real hit since it’s launch earlier this year. Users like the traditional MobileDemand ruggedness and ease of use features, Windows 10 Home or Pro OS, accessories such as the detachable keyboard and of course great value for money. It’s important to understand MobileDemand’s philosophical approach to the Flex line. In essence, the difference between the company’s higher end xTablets and the Flex models is that the former are designed and built as cohesive, fully integrated rugged tablets with significant performance and capabilities, whereas the Flex line makes a ruggedized package available at the lowest possible price. For the Flex models, MobileDemand is sourcing generic tablets that meet the company’s features and performance goals. 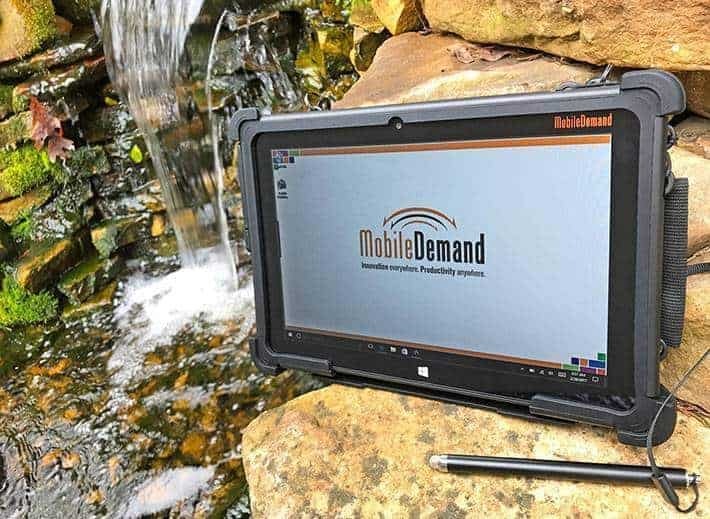 MobileDemand then custom-designs protective rubber boots with thick bumpers to securely cushion and cradle the tablets, and that assembly then goes into a sturdy, also custom-designed polycarbonate backplate. The picture below shows that the Flex approach goes well beyond what any third party aftermarket case can offer. Unlike the weird waver-thin accessory keyboards offered for many consumer tablets, MobileDemand’s Flex 10A keyboard is a true keyboard with full keyboard functionality, good key travel, and excellent tactile feedback. It also has a very sturdy hinge that allows for a very solid connection to the tablet. Combined with the easel, it makes for full and complete laptop functionality, should that be required. To learn more read the review take a look at the specs or get in touch with us to arrange a webinar or meeting about the Flex 10A.